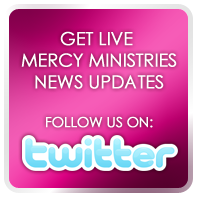 Mercy Ministries News: You Make an Eternal Difference! You Make an Eternal Difference! On behalf of all our residents and staff, I want to thank those of you who support Mercy Ministries financially. You are making an eternal difference! I was sexually, physically and verbally abused from ages 5 to 15. In middle school, I developed an eating disorder and began cutting, and in high school I started using drugs. I was placed in 43 different hospitals, group homes, and state hospitals for children. In my adult years, I found myself trapped in a world of prostitution and drugs. I heard about Mercy in the ICU after a near-fatal drug overdose. During my time at Mercy, God broke down my walls. The first scripture I learned was Jeremiah 29:11… God has a purpose for my life! That really meant a lot to me because I thought my purpose was to be in a state hospital my whole life since that’s what I had been told. I learned that I am loved, and I am able to love others. Today, my life and family relationships have been completely restored! Nicky’s story would not have this happy ending if not for the life-changing power of Jesus Christ. That’s why Mercy Ministries remains committed to the principle of not accepting any government funding or any other money with strings attached. Without the freedom to share Christ with these girls, there is no transformation. I hope you are encouraged to know that you are a part of Nicky’s testimony. Supporters like you make this ministry possible, and we pray daily for you! P.S. I’m excited to announce that we’ve just released a new, 30th Anniversary Edition of the book Echoes of Mercy, and it’s available during the month of March for just $10! This special edition includes never-before seen photos, new chapters, fully updated content and even more inspiring stories. Visit www.mercyministries.com/books to order your copy today!